Brighton & Hove Albion manager Chris Hughton on the touchline against Manchster City. Picture by PW Sporting Pics. A Sergio Aguero strike and Lewis Dunk own goal in the last 20 minutes handed the visitors a 2-0 victory on the opening day of their Premier League campaign. Those goals came in the last 20 minutes as Albion held off their opponents for much of the contest in their first game in the top flight for 34 years. 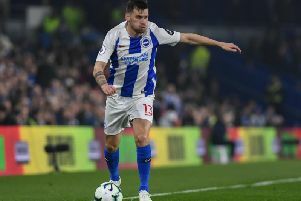 It was an organised and well-disciplined defensive showing from the Seagulls for much of the contest and Hughton said: "I thought for 70 minutes we played the game that we had to play, when you are up against the qualities they have got. They have targets of the Champions League ours is to make sure we are in this division next season. "I think you have to play that way and for 70 minutes we kept them to minimal good chances, but probably the first moment we allowed ourselves to get really stretched as a team, they capitalised on us and that's the quality they have got. "It is what it is. The likes of Manchester City they can afford to do what they have done this summer and good luck to them. They have have their eyes on winning the league and the Champions League. We have to be able to work as hard as we can with what we have got and we have got a good group and we showed that in our way. "One negative was that when we did have have ball, we probably could have kept the ball better and maybe for longer periods than we did, but certainly in regards to our defensive work, I thought we did ever so well. "There were ceretainly more positives than ngeatives. Sometimes you go into the first game of the season and some teams have not had a particularly good season, but these (City) have been exceptional. Our season won't be decided by the likes of your Manchester Citys, Uniteds and Chelseas, it's the other group and that is where we must make sure and get our points"